# or impossible to write to the UART directly, like MMU bringup code ;-). # get printed here as param0..2 but I am too lazy to check. # smc_undefined:67: Undefined monitor call! The Nexus 9 is based on a 64-bit nVidia K1 chip. At the moment it is the most affordable (price wise) and accessible (unit-wise) platform for exploring OS work on an AArch64 platform. 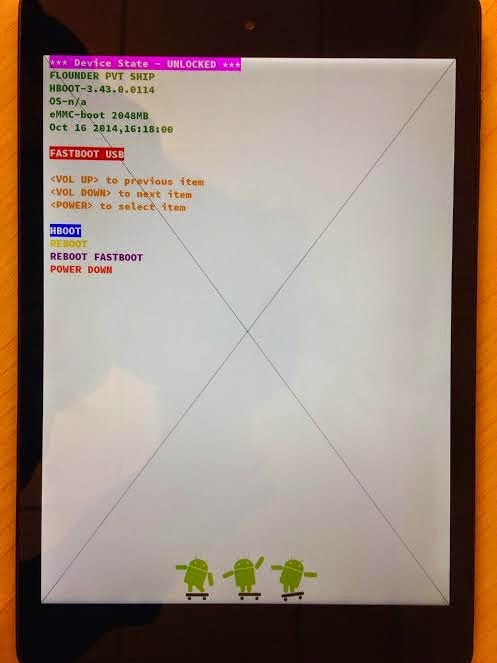 The Nexus 9 allows performing an unlock via "fastboot oem unlock", allowing custom Android images to be booted. This is a small demo, demonstrating how to build and boot arbitrary code on your Nexus 9 and do some basic I/O. The demo demonstrates serial I/O and draws two black diagonal lines on the framebuffer. Be contained in an "ANDROID!" boot image. The link address appears to be hardcoded in HBOOT. The Android boot image bases and the AArch64 kernel header fields appear to be ignored. The boot image can contain an additional ramdisk/initrd/payload. The FDT is patched by HBOOT to contain correct linux,initrd-start and linux,initrd-end addresses. Connect your Android tablet via a USB cable. Optionally connect the UART headphone jack adapter to your computer. The settings are 115200 8-n-1. "nexus9_dts" is the decompiled "nexus9_dtb". "nexus9_dtb" was extracted from the Android boot.img. "nvtboot" (32-bit) runs on the AVP/COP. "nvtboot" loads "tos" (64-bit) (Trusty aka Secure OS) on the AArch64 chip. HBOOT loads Android and implements the fastboot protocol. It's unclear how to enter NVFlash/APX mode, or how helpful that would be.